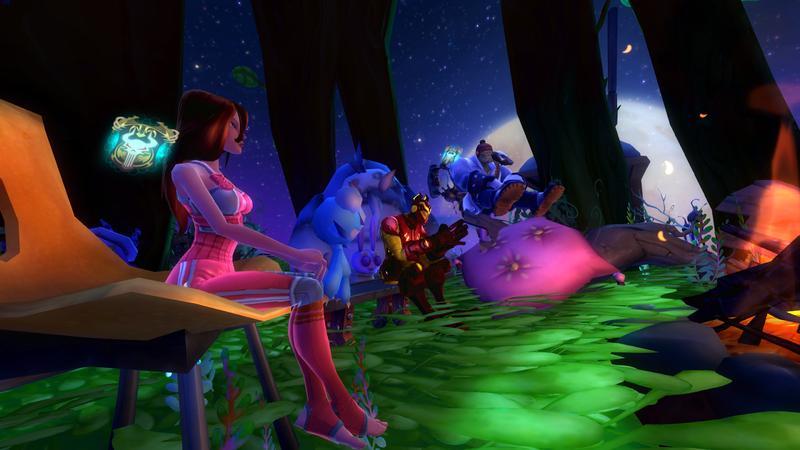 Not too long ago, I talked about housing being one of the most robust features in WildStar. Well, I neglected to talk about the costuming system as well, especially after the Holo-Wardrobe addition in the latest drop (Drop 5). While I love the things people do with their costumes, I’ve never been good at putting them together. I pretty much run with one costume that’s my main, and a few I kind of switch out, but those other than my main took forever to put together. And my main costume? I’ve had it since, oh, level 14. Yep. It hasn’t been changed since the first few months of the game. That’s how much I stink at costuming. But some of the guildies do an amazing job with costuming! Sheae, for instance, is sporting a cute “pretty in pink” look, and Positive is pulling off a pretty awesome Iron Man in the background. It’s awesome seeing so much creativity in-game with the costume system! Maybe one day I’ll take the time to sit down with a list of dyes to collect them all and work on changing out some costumes. I love the costume system, was always changing mine back when I played but then I always get big into the mmo wardrobe systems. Already starting in swtor.. haha. That Iron Man is awesome! And even if you feel you're not pro at putting outfits together, you're definitely pro at putting together good-looking screenies! And sheesh, I should really tune down on the ! 's.